There are a number of corneal conditions that can affect your eye health, vision, comfort and, in some cases, appearance which we see with some frequency at Baltimore Washington Eye Center. These include recurrent corneal erosion or “scratched cornea”, pterygium, Stevens-Johnson Syndrome (SJS), and dry eyes. Were indicated, as a corneal specialist, I can offer consultation, diagnosis, and treatment for the full range of corneal conditions. Recurrent Corneal Erosion (RCE) is a condition of the cornea whereby there is a poor attachment of the outermost layer of the cornea, the epithelium, to the underlying basement membrane layer, called Bowman’s Membrane. Patients who experience Recurrent Corneal Erosion may experience sharp pain, light sensitivity, tearing and watering of their eyes, and a gritty sensation. Often this occurs upon awakening or rubbing the eyes. Recurrent Corneal Erosion is a condition that may be associated with Map-Dot-Fingerprint Dystrophy. We may initially prescribe salt solution eye drops or ointment as the first line of treatment. This medication helps the epithelium to adhere more firmly to Bowman's Membrane. Usually artificial tears are also recommended to keep the cornea moist. Sometimes, a soft bandage contact lens will be used to help the healing process. Those patients who have a corneal dystrophy may require additional treatment. This usually includes an in-office procedure called “stromal puncture”. Microscopic "spot welds" are made on the cornea with a special needle, under local anesthesia, to encourage the epithelial layer to bond securely to Bowman's Membrane. For those patients, who continue to suffer from Recurrent Corneal Erosions despite the treatments described, we may recommend Phototherapeutic Keratectomy (PTK) which involves removal of the superficial layer of corneal cells using the Excimer Laser to encourage proper healing. A pterygium is a fleshy triangular growth of tissue on the cornea that may grow slowly throughout a person’s life. 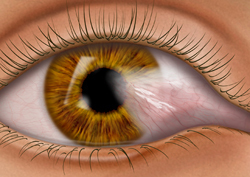 Rarely, a pterygium can grow across the cornea and block the pupil. People who live in sunny climates where they are exposed to more sunlight and UV light are more prone to developing pterygia. Pterygia may become red, swollen and inflamed and sometimes they need to be removed. Removal of a pterygium is a surgical procedure that has recently undergone medical advances including a technique we now use called Amniotic Membrane Graft in order to prevent recurrences and obtain the best possible results for pterygium surgery. Stevens-Johnson Syndrome, also called Erythema Multiforme, is a disease of the skin that also affects the eyes. SJS causes blistering and painful lesions on the skin and mucous membranes throughout the body. If SJS is extreme it can cause conjunctivitis, corneal blisters and erosions or iritis-an inflammation of the iris. While the exact cause of SJS is not clear, it is believed that it can occur from an adverse reaction to drugs such as sulfa containing drugs. SJS can occur in any age group but seems more common in those under 30 years of age. Dry Eye Syndrome is a very common eye condition that can affect the cornea. Anytime there is inadequate tear production, too rapid tear evaporation or drainage, the symptoms of dry eyes may become present. The symptoms of dry eyes include a scratchy, dry, sandy or gritty feeling that can be accompanied by a stringy clear white discharge with noticeable pain and redness. Dry eye creates additional risk of corneal infection, since the tear film, which serves to protect against infectious organisms among other functions, is deficient. Fortunately, our team of eye doctors has a great deal of expertise in the advanced diagnostic testing of dry eyes and will be able to make a treatment recommendation for your individual situation. For those patients with mild to moderate dry eyes, the first course of treatment may be to use unpreserved artificial tears or lubricant eye drops. Depending on the nature of your tear film deficiency, they may prescribe a specific type of artificial tear that has different characteristics in terms of salt content, viscosity or lubricity. In addition, it may be necessary to insert tiny “punctal plugs” into the openings of your tear ducts, in order to slow down or even stop the drainage of tears away from the eye. Occasionally there are some cases that may not respond to the above sequence of treatment options because of some underlying low-grade inflammatory or infectious process. In these cases it may be necessary to also prescribe an oral antibiotic such as a tetracycline, or an anti-inflammatory eye drop such as a corticosteroid eye drop. If you suffer from moderate to severe dry eyes we may prescribe Restasis® eye drops, which, in addition to the other treatments, can often help alleviate your symptoms. Restasis® is an advanced type of cyclosporine eye drop that acts by blocking a specific type of inflammatory cell from entering the Lacrimal Gland, which produces normal tears. By reducing or blocking inflammation in the Lacrimal Gland, it functions much more effectively so that you can actually make more of your own natural tears and keep your eyes moist and lubricated. If you experience corneal conditions such as recurrent corneal erosion, pterygium, Stevens-Johnson Syndrome or dry eyes you will need a thorough exam, diagnosis and treatment to help you maintain your eye health, vision and comfort. Please call Baltimore Washington Eye Center at 800-495-3937 to schedule an appointment. About Corneal Conditions at Baltimore Washington Eye Center in Glen Burnie and Gambrills Maryland.